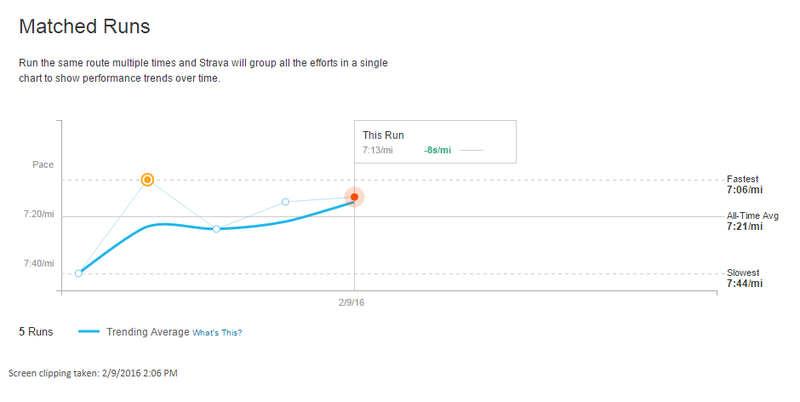 In which I provide a sample of the way I personally use fitness data to improve my running. Boy, have I felt great this week! It's like heading out for a daily five-miler is easy, compared to just two weeks ago. Hmm, well, maybe it's not just "like" that. Maybe it really is getting easier to run those five miles. How might I determine whether that is true? One way would be to look at how many calories I've expended. Simply comparing one run to another isn't really fair - a lot of different things can happen to your body from day to day. To gain better insight, I'll have to do some "data tricks." 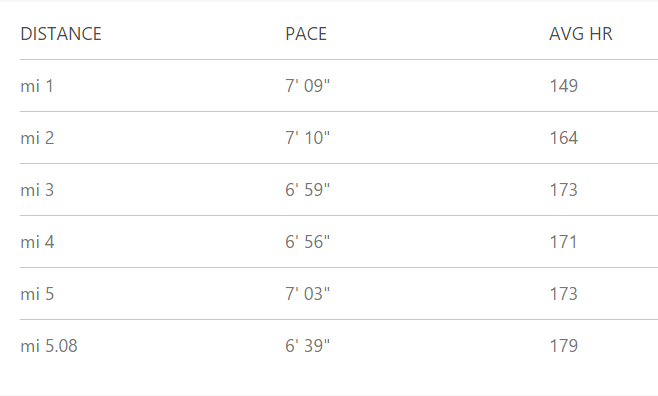 My eight most recent runs have all been about five miles long. Adding the estimated calories expended for the most recent four (as reported by my Garmin Forerunner or Microsoft Band 2) yields a total of 2,219 calories, or 554.75 calories burned per run, on average. For the four preceding runs, the values are 2,327 and 581.75, respectively. So, things do seem to be getting a little easier for me. If I were training for a race, this would be great news, since it would indicate improving levels of either running economy, cardiovascular efficiency, or both. However, I'm not training for a race. My perspective needs to shift a little. This week, in order to have a workout equivalent to the workouts I was doing last week, I need to either run further or faster (or both). Of course, my fitness tracker will help me with this, since it tracks both distance and pace while I'm running. Keeping these factors in mind, I'll be able to add up the calories expended on my next four runs and compare the result to the previous two figures. I'll thus ensure that my subsequent workouts are, on average, at least as tough as last week's, if not a little tougher. And that, friends, is how you can use data to lend some objectivity to your workout efforts. Nifty! Of course, any run mapping interface will give you similar feedback, although some will require that you enter the course name in manually before it can be compared. 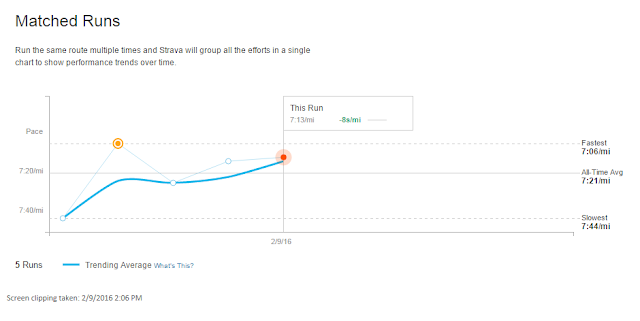 Strava appears to provide additional insights, such as "pace analysis," for a premium fee. I get it for free via Garmin Connect, or more recently Microsoft Health. From this table, a couple of things pop out right away: (1) My first two mile splits are the slowest, and (2) Thereafter, my average heart rate basically doesn't change. I might draw all sorts of conclusions from this data, but knowing for myself how the workout actually felt, I conclude that I ought to increase my pace at the outset of the workout. I might use the heart rate monitor as my guide here. It does take about a half a mile to get my heart rate up to "workout levels," but after that I can set a target more in line with my expected heart rate for the rest of the run. 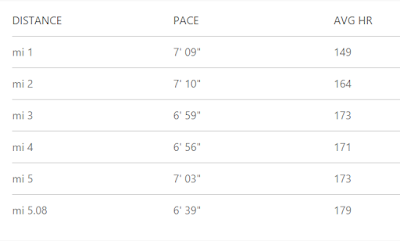 If, during the last half of the run, I experience either a big decline in running pace, or a noticeable increase in heart rate, or both, I'll consider it a failed experiment. My guess, though, is that I can pick up the pace early on with little to no impact on the last half of my run. Another interesting data point to notice is that the last one-tenth of a mile was run at a much faster pace than the previous mile. This suggests that I may have lost a lot of momentum during the first half of Mile 5. No surprises here - there was a big elevation gain during that mile. But if I want to improve my performance on a run like this, I ought to focus on maintaining a strong pace during the last mile. There are a few things available in the Garmin interface that do not appear in the Microsoft Health interface. They are: Ground contact time, vertical oscillation, and running cadence. Cadence is a concept imported from the cycling world. When cycling, it's important to maintain a steady speed over long periods of time. Cadence in this context makes some sense because gears are variable, so different cadences translate into different speeds, depending on what gear one is using during the ride. This means that, if you want to cover a given distance in a given period of time, you will have to translate that into different cadences, depending on your gear selection. There is a direct relationship between the gear, the cadence, and the speed of travel. Runners, though, don't have gears. And while stride is variable, it is impossible to know the exact length of one's stride during the run itself. Thus, focusing on cadence provides no information that isn't already provided by pace. Furthermore, while the writers seem to imply that shorter strides are always better, stride (like forward lean) can be varied throughout a run to achieve different results. A short stride during an uphill climb saves a lot of energy, but a short stride during a downhill charge expends it needlessly. And because stride is variable, cadence must also be; nor should there ever be a dedicated "range" one's cadence should fall into. I would make a similar criticism of ground contact time. Does it really matter how long your feet stay on the ground on a per-stride basis? Is there any ex ante reason to believe that a longer or shorter value for ground contact time is better or worse for running? No. Instead, ground contact time might be an indicator of some other running issue, but I can't think of a single issue offhand that would be indicated primarily by ground contact time. So it makes sense to me that Microsoft Health doesn't track this data. It doesn't provide the user with any information worth thinking about. For the most part, it's a false lead. Vertical oscillation actually is useful to analyze, because the greater the oscillation, the less efficient the runner's form. Making noticeable decreases in your vertical oscillation will almost certainly make you a better runner. This is maybe the only thing I'll "miss" about switching to a Microsoft Band 2.